Gandhāra (derived from Sanskrit word literally meaning "perfumed"; also known as Waihind in Persian) was one of the major ancie nt Indian Kingdoms (Mahajanapadas) in northern Pakistan and eastern Afghanistan. Gandhara was located mainly in the vale of Peshawar, the Potohar plateau (see Taxila) and on the northern side of the Kabul River. 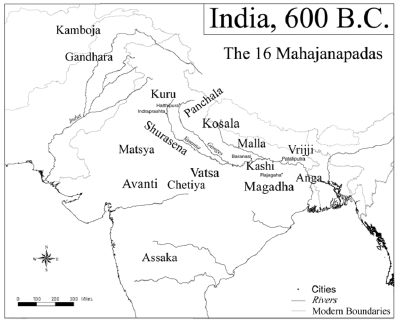 Its main cities were Purushapura (modern Peshawar) and Takshashila (modern Taxila). The Kingdom of Gandhara lasted from the 6th century BC to the 11th century AD. It attained its height from the 1st century to the 5th century AD under Buddhist Kushan Kings. After it was conquered by Mahmud of Ghazni in 1021 AD, the name Gandhara disappeared. During the Muslim period the area was administered from Lahore or from Kabul. During Mughal time the area was part of Kabul province. The Gandharas were settled since the Vedic times on the banks of Kabul River (river Kubha or Kabol) up to its mouth into Indus. The region is known as Peshawar Valley. Later the Gandharas crossed the Indus and included parts of north-west Punjab of Pakistan. Gandhara was located on the grand northern high road (Uttarapatha) and was a centre of international commercial activities. It was an important channel of communication with ancient Iran and Central Asia. The boundaries of Gandhara varied throughout history. Sometime the Peshawar valley and Taxila collectively referred to as Gandhara. The Swat valley was also sometimes included. However, the heart of Gandhara was always the Peshawar valley. The kingdom was ruled from capitals at Pushkalavati (Charsadda), Taxila, Purushapura (Peshawar) and in its final days from Udabhandapura (Hund) on the Indus. Cyrus the Great (558-530 BCE) built first universal empire of the world stretching from Greece to the Indus River. Both Gandhara and Kamboja soon fell a prey to the Achaemenian Dynasty of Persia during the reign of Cyrus the Great or in the first year of Darius I. The Gandhara and Kamboja had constituted the seventh satrapys (upper Indus) of the Achaemenid Empire. When Achamenian took control of this kingdom, Pushkra-sakti a contemporary of king Bimbisara of Magadha was the king of Gandhara. He was in power struggle against kingdoms of Avanti and Pandavas. The inscription on Darius' (521-486 BC) tomb at Naqsh-i-Rustam near Persepolis recorded GADARA (Gandhara) along with HINDUSH (West Punjab) in the list of satrapies. The Greek historian Herodotus (490-420 ? BC) in his book The Histories gave list of twenty provinces of Persian Empire. He reported Gandhara as Paktuike (3:93) and in another passage identified this territory with Peshawar Valley (4:44). The word Paktuike is interesting since present inhabitants of Gandhara are known as Pakhtun. Under Persian rule system of centralized administration and bureaucratic system introduced to the region. Influenced by the Persians and access to Western Asians civilization, the great scholars like Panini and Kautilya born in this cosmopolitan environment. Kharosti alphabet derived from Aramaic (official language of Achaemenians) alphabet developed here and remained national script of Gandhara until third century AD. By about 380 BC Persian hold weakened. Many small kingdoms sprang in Gandhara. Around 327 BC Alexander the Great invaded Gandhara and Indian Satrapies of Persian Empire. His stay in this area was merely less than a year. This did not have any immediate administrative or cultural effect. The expeditions of Alexander were recorded by Arrian (around 175 AD) in Anabasis and other chroniclers many centuries after the event. The names of places and personalities described in these chronicles are difficult to identify. The companions of Alexander the Great did not record the names of Kamboja and Gandhara and rather located a dozen small political units in their territories. Alexander conquered most of these political units of the former Gandhara and Kamboja Mahajanapadas. According to Greek chroniclers, at the time of Alexander's invasion, hyparchs Kubhesha, Hastin (Astes) and Ambhi (Omphes) were ruling lower Kabul valley, Puskalavati (modern Charasadda) and Taxila respectively, while Ashvajit (chief of Aspasios or Ashvayanas) and Assakenos (chief of Assakenois or Ashvakayanas) (both being sub-units of the Kambojas) were ruling upper Kabul valley and Mazaga (Mashkavati) respectively. 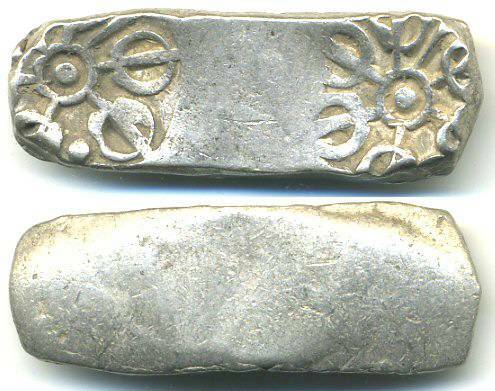 In Rajgor catalogue the symbols are incorrectly recorded - the dot is NEVER located right in front of the bar on the symbols on the early, but it is placed at 120 degrees from the bar (see the photo below). All the symbols in Rajgor reproduce this mistake, for some reason. The symbol with a dot in front of the bar is sometimes (very rarely) found on the later silver (but not debased) issues. This online catalogue should include most different types of Gandhara Janapada coins - I was trying to be a thorough as possible. Some of the types that are not listed will be added to this site sometimes soon. These fascinating large coins, equal to about 3 karshapanas, are the most likely candidates to be the very first Indian coins ever struck. During the 6th century BC Gandhara was a subject of the Persian Empire (as known from an inscription dating to the times of Darius, ca.520-518 BC). 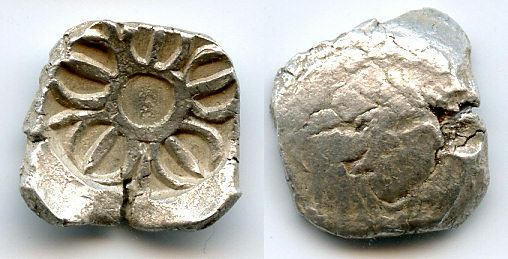 The Persians are likely to have introduced the native Gandharans to the idea of a struck coinage. 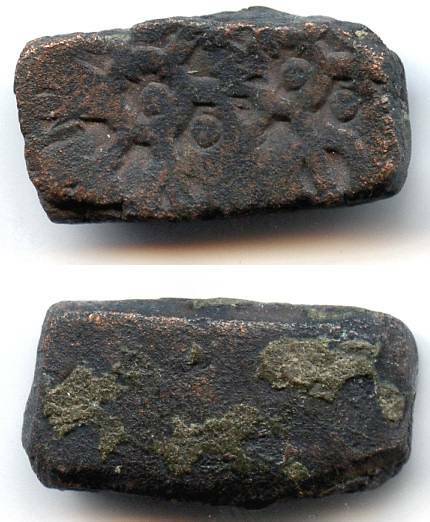 The earliest Gandharan coins - shatamanas (=100 manas, the meaning is unknown, also known as "bent bars") , were probably based on a Persian siglos standard, since the average weight of these shatamanas equals to the weight of 2 Persian sigloi. From Gandhara, the idea of struck, or punchmarked, coinage spread south and soon the punchmarked coins were produced in many other regions of northern and central Indai. 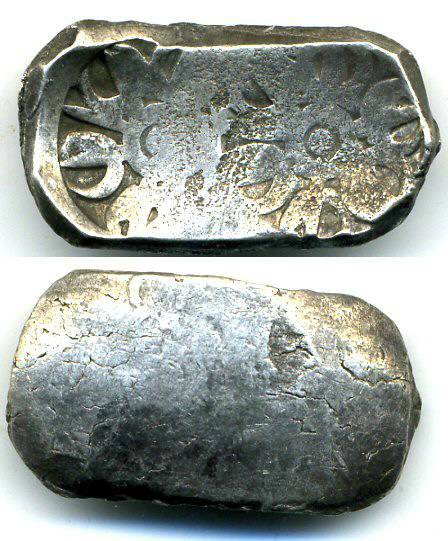 This theory concerning the first coins in India is quite widespread, though it is not accepted by everyone (some people prefer an idea of independent invention of coinage, and are against the idea of the foreign introduction). These shatamanas were issued over a long period of time, though it is uncertain when their production ended (Chandragupta Maurya conquered Gandhara around 300 BC, and the production of the independent Gandharana coinage did not continue pass that point). The good silver shatamanas were replaced by the short debased issues and then by silver plated and copper bars (which are much more common and retail for about 100$ each). 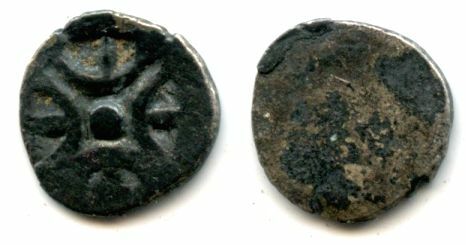 The early good silver shatamans are very rare - although a few hoards of these coins were unearthed in the last century, very few coins reached the numismatic market. The narrow long type is quite rare - the length of these pieces is generally between 40 and 50 millimeters, and they are pretty narrow (7-9mm, usually). Because they are so narrow, the imprint of the punch is always partial, and the entire symbol can never be seen on these. The presence or the absence of the dot and the exact variety of the punchmarks is usually difficult to determine because of that - it is possible that a number of different varieties exist, but they are difficult to identify. They are made of high quality silver and were probably minted in the first half of the series production. 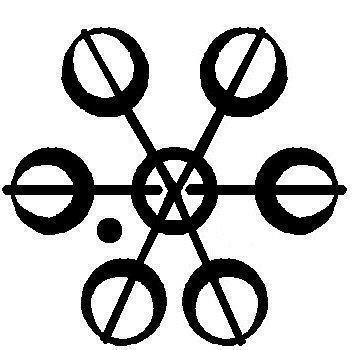 "Bent bar" flan, uniface, two identical symbols. 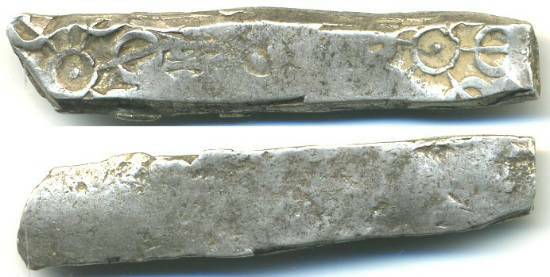 Long concave silver bar, 48mm long, 9mm wide, struck with a 6-armed Gandharan symbol on each end. 11.4 grams. Rajgor 542. SUPERB for these, rare this nice! Long narrow type is very rare. This type is not likely to have been manufactured by the authorities for general circulation. 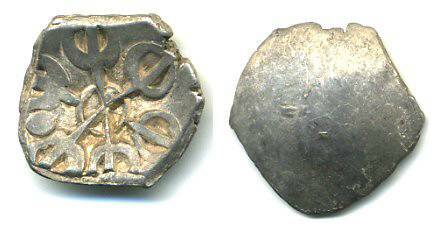 The silver coating indicated that the coins were made by the ancient counterfeiters in order to deceive. Some bars appear to be made out of copper, like the one pictured below. I don't think any specimens (especially of the early types, like the one pictured) were officially produced - the coins that look like they are made out of copper were probably once silver-coated fourees which lost all (or most) of their silver coating. In fact, all the "bronze" bars I've seen have small patches of silvering remaining, though they are not always apparent. The coin pictured is completely devoid of silvering on obverse, but has a small, but thick patch of silver on reverse. All such coins are fairly scarce. 46mm long, 9.8 grams. Quite a bit lighter than the "normal" silver shatamanas. Traces of dark silvering on reverse (?). 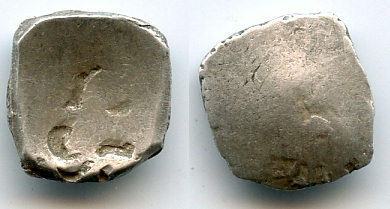 Rajgor 552var. 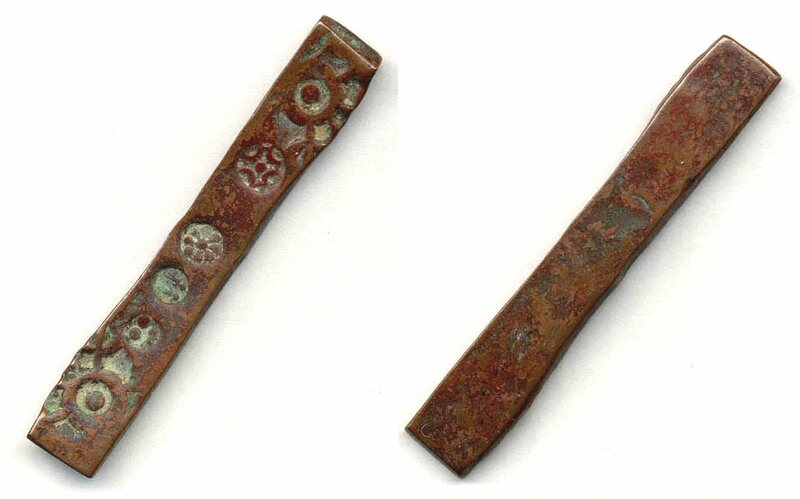 Long and narrow bronze bar with smooth red patina, usually with a lot of flower-shaped and sun-shaped bankers' marks. If you see high quality bronze bars with smooth patina (and without traces of silvering), there is a good chance that the piece is fake. 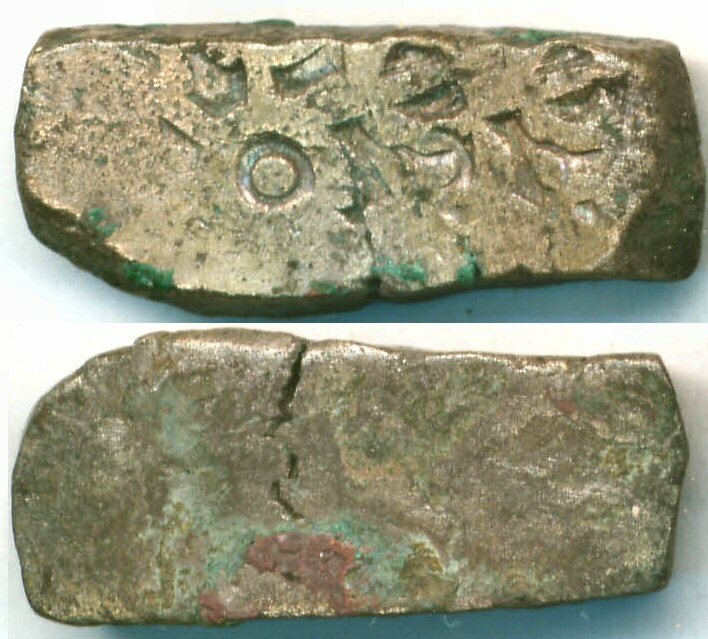 Some modern fake bronze bars of this type can be found in the numismatic market. Type of high-purity silver bars, usually 36-39mm long, 10-13mm wide - falling in size right between the long type and the short type. Never seen debased. Probably one of the earlier types. 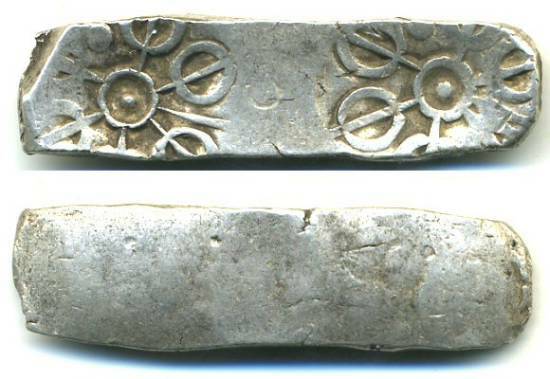 High quality silver concave silver bar, 37.5mm long, 12mm wide, struck with a 6-armed Gandharan symbol on each end. 11.1 grams. Rajgor 552. "Bent bar" flan, uniface, two different symbols. 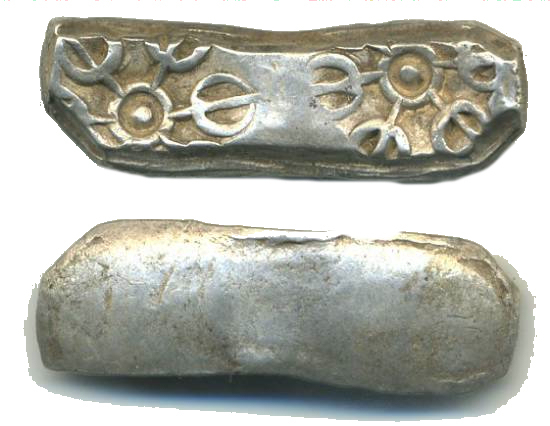 Long concave silver bar, 33mm long, 12mm wide, struck with a 6-armed Gandharan symbol on each end. 11.5 grams. Rajgor unlisted. SUPERB for these, rare this nice! This particular piece has two DIFFERENT punches - something that seems to be unpublished for these shatamanas (the published examples always depict an identical symbol struck on both ends of the piece). 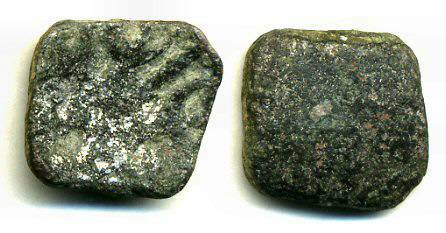 This coin is of numismatic significance, suggesting that different punches were employed in Gandhara at the same time. 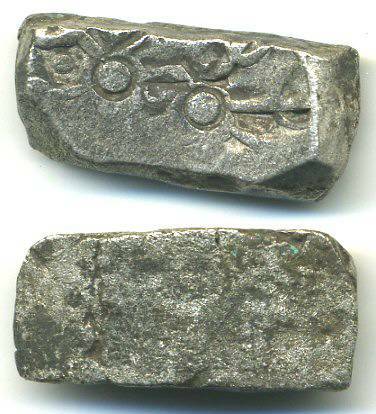 High quality concave silver bar, 36mm long, 11mm wide, struck with a 6-armed Gandharan symbol on each side. 11.3 grams. 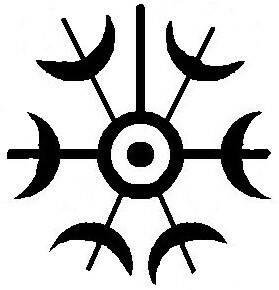 Rajgor 546 (with the symbol wrongly depicted, as described above). 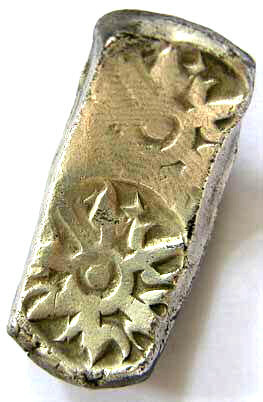 40mm long, 10mm wide, struck with a 6-armed Gandharan symbol on each side. 11.5 grams. 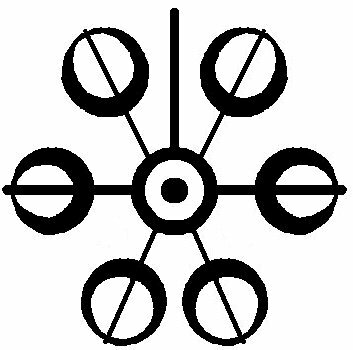 Rajgor 546 (with the symbol wrongly depicted, as described above). This type is not likely to have been manufactured by the authorities for general circulation. The silver coating indicated that the coins were made by the ancient counterfeiters in order to deceive. Some bars appear to be made out of copper, like the one pictured below. I don't think any specimens (especially of the early types, like the one pictured) were officially produced - the coins that look like they are made out of copper were probably once silver-coated fourees which lost all (or most) of their silver coating. All such coins are fairly scarce. 38x9mm, thick coating of silvering that came off on one side, exposing the copper core. Originally the piece was probably slightly longer. Notice the light weight of the piece. 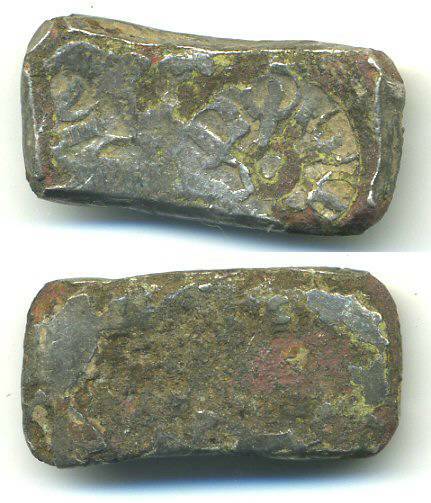 29mm long, 16mm wide, struck with a 6-armed Gandharan symbol on each side. 11.5 grams. 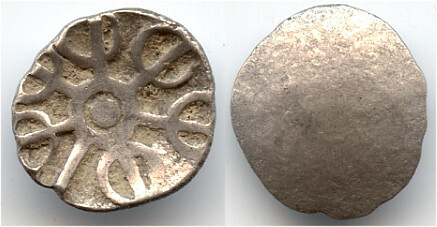 Rajgor 540-545 var. 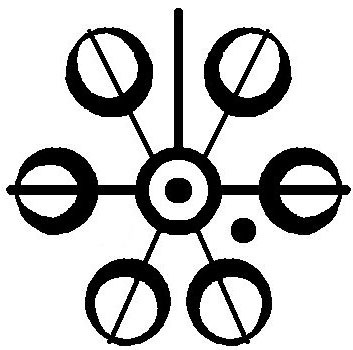 "Bent bar" flan, uniface, two identical symbols - identical to the previous type, but the circles are incomplete. Struck with a 6-armed Gandharan symbol on each side. 11.5 grams. 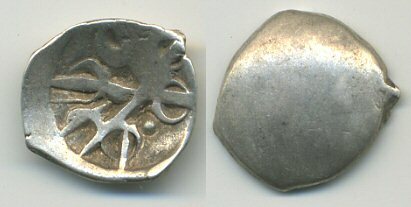 Rajgor 540-545 var. These coins are rare, and might be of unofficial manufacture (?). "Bent bar" flan, uniface, two identical symbols with the dot located right in front of the bar. These are extremely rare and are found only on later silver issues (though not on debased issues). These coins exhibit very slight debasement. Struck with a 6-armed Gandharan symbol on each side. 32x13mm, 11.5 grams. 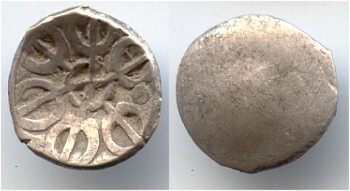 Rajgor 540-545 var. This type is not likely to have been manufactured by the authorities for general circulation. The silver coating indicated that the coins were made by the ancient counterfeiters in order to deceive. Some bars appear to be made out of copper, like the one pictured below. I don't think any specimens (especially of the early types, like the one pictured) were officially produced - the coins that look like they are made out of copper were probably once silver-coated fourees which lost all (or most) of their silver coating. In fact, all the "bronze" bars I've seen have small patches of silvering remaining, though they are not always apparent. The coin pictured is completely devoid of silvering on obverse, but has a small, but thick patch of silver o reverse. All such coins are fairly scarce. 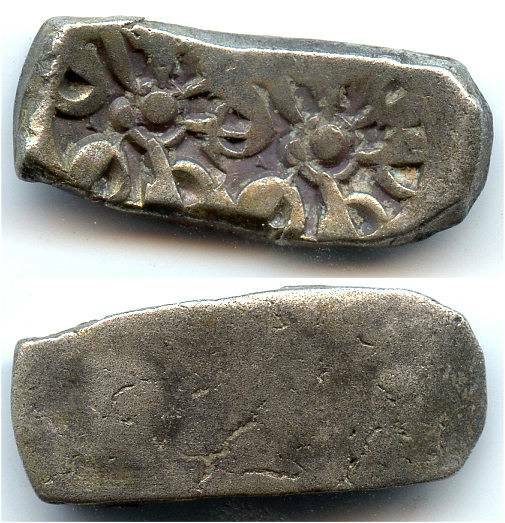 Short concave silver bar, 27mm long, 13mm wide, struck with a 6-armed Gandharan symbol on each end. 10.0 grams. Rajgor 550. Late debased type. Scarce this nice! 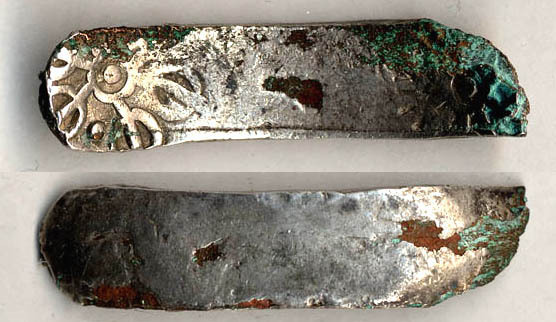 In the later period, the shatamanas started getting more and more debased - the short bars were struck from a progressively lower and lower quality silver. The quality of the metal varies widely (some representative examples are shown below). 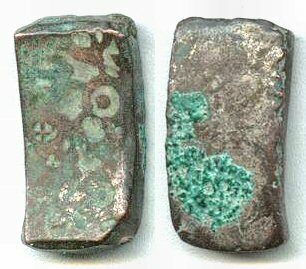 The earliest pieces were struck of fair silver with grayish tint, but the late pieces were struck from metal that resembles copper much more than silver. The quality of the strikes also went down - the punches usually overlap and are poorly struck. In most cases it is impossible to identify the punchmark variety. The coins struck in decent silver are fairly rare, but the debased crudely struck pieces are much more common. Also, the coins with clear and well-struck impression of the punch are much more rare than the poorly struck pieces. 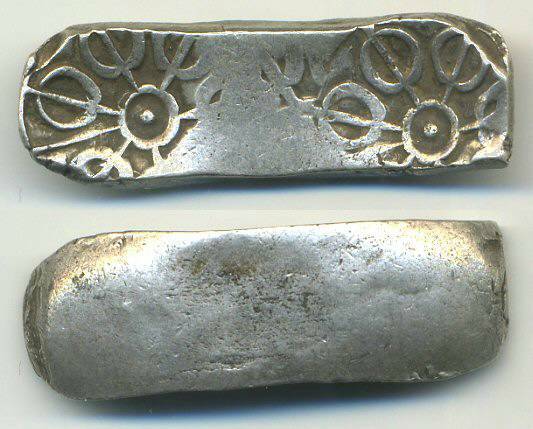 Short concave silver bar, 26mm long, 11mm wide, struck with a 6-armed Gandharan symbol on each end. 11.4 grams. Rajgor 551. 30mm long, 13mm wide, 11.44 grams. Relatively early type, made of decent silver. Rajgor 552. 32mm long, 10.8 grams. Rajgor 552. 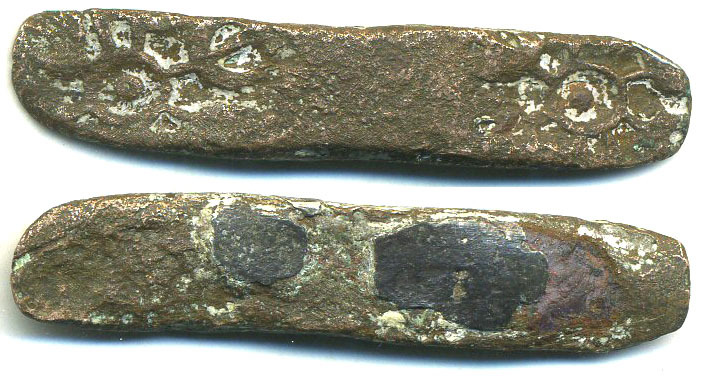 Short concave bronze bar, 22mm long, 11mm wide, struck with a 6-armed Gandharan symbol on each end. 10.6 grams. Rajgor -. 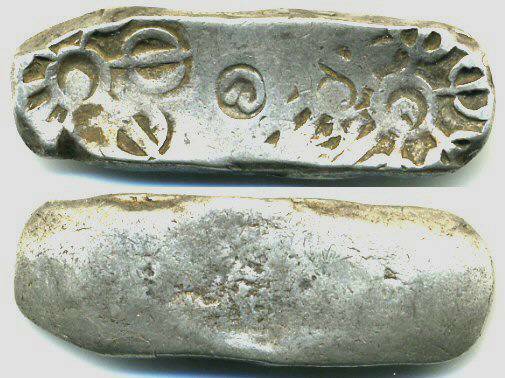 "Taxila Bent Punchmarked Bar c. 450 BC. Billon Debased Early Type. Crude fine, with some adhesion. Size: 24 mm.Weight: 11.20 grams." 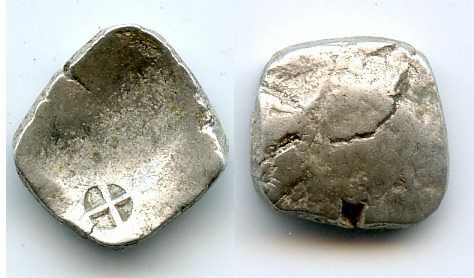 The Shatamana fractions were probably not produced along with the earliest silver shatamanas, but some probably entered circulation around 500 BC. Various fractions were introduced - the denominations were 1/2 shatamana (4 shana), 1/4 shatamana (2 shana), 1/8 shatamana (1 shana), 1/16 shatamana (1/2 shana) and 1/32 shatamana (1/4 shana). All the fractions were minted on round concave flans, and were stamped with a single punchmark on one side. 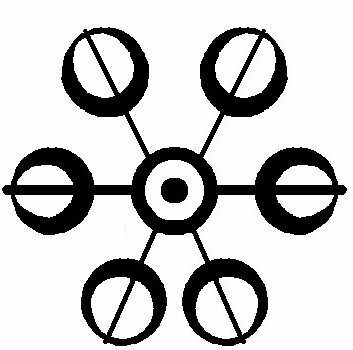 With the exception of the small denomination (which correctness of attribution can be argued) were stamped with the same "6-armed" symbol used on shatamanas. These coins are generally somewhat more common than the full shatamanas, but the larger denominations (like 1/2 and 1/4 shatamana) as well as the smallest denomination (1/32 shatamana) can very difficult to find. Just like the silver shatamana, the fractions underwent significant debasement. 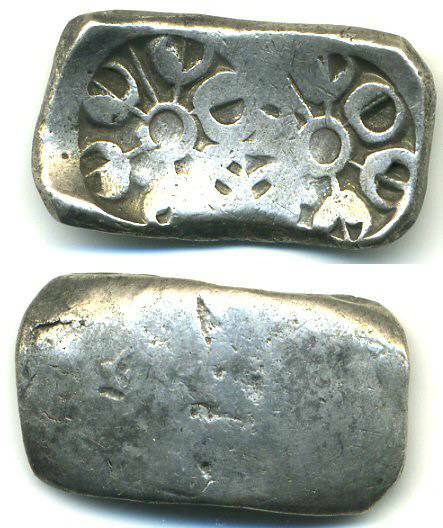 The earlier coins were made of high quality silver, but silver content kept decreasing and the latest coins (mostly 1/4 karshapanas) made out of very base silver and struck with crude dies. 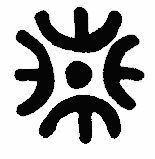 No photo Round scyphate flan, uniface, single symbol. 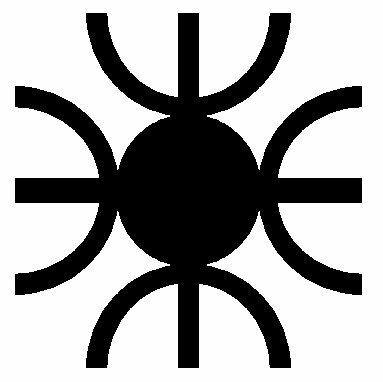 Punchmark (6-armed Gandharan symbol without a bar and dot between two of the arms) / blank. 16-17mm, 5 grams. Rajgor PMC 560. I have never handled 1/2 shatamana from Gandhara, though, at least according to Rajgor, they are not any scarcer than the smaller fractions (I would say that they are scarcer and (certainly) more expensive). One single type is listed, with a plain 6-armed symbol, without a bar or the dot. Round scyphate flan, uniface, single symbol. Punchmark (6-armed Gandharan symbol with a bar and dot between two of the arms) / blank. Artificially patinated. 16-17mm, 6 grams. Unpublished. All 1/2 shatamanas with this punchmark come from a single issue of modern fakes. Round scyphate flan. Punchmark (5-armed Gandharan symbol with 3 bars and one dot in the middle / blank. Rajgor -. Round scyphate flan. Punchmark (5-armed Gandharan symbol with 3 bars and no dot in the middle / blank. Rajgor -. Round scyphate flan. Punchmark (5-armed Gandharan symbol with 5 bars and one dot in the middle / blank. Rajgor -. Round scyphate flan. Punchmark (6-armed Gandharan symbol with a bar and no dots / blank. Rajgor 561. Round scyphate flan. Punchmark (6-armed Gandharan symbol with a bar and no dots / blank. Rajgor 562-563. Round scyphate flan. Punchmark (5-armed Gandharan symbol with a bar and dot between two of the arms) / blank. 13mm, 2.54 grams. Rajgor 564-565. Very rare, known to me from only a few specimens. This type also exists in billon (reportedly), though I've never seen one. Round scyphate flan. Punchmark (5-armed Gandharan symbol with a bar and dot between two of the arms) / blank. 13mm, 2.7 grams. 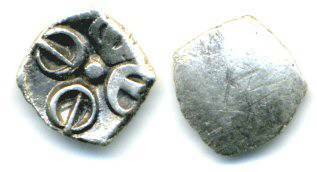 Rajgor 565 var (unlisted for a 5-armed symbol). Rare 1/4 shatamana, from a late debased issue (not quite copper yet, though). Rarely seen (scarcer than the 1/8th shatamana). Round scyphate flan. Punchmark (6-armed Gandharan symbol with a bar and no dots / blank. Rajgor 566. Round scyphate flan. Punchmark (6-armed Gandharan symbol with a bar and no dots / blank. Rajgor 567. These coins are fairly scarce, but a hoard of these hit the market in 2006, and right now they are available in the numismatic market. The size ranges from 14 to 17mm, and the weight ranges from about 1.3 to 1.6 grams. 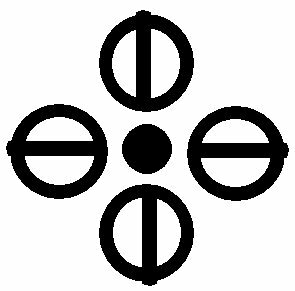 Punchmark (6-armed Gandharan symbol with a dot between two of the arms) / blank. 15mm, 1.5 grams. Rare without the dot. Rajgor 574. Punchmark (6-armed Gandharan symbol with a dot between two of the arms) / blank. 15mm, 1.5 grams. Rare. Rajgor 570. Punchmark (6-armed Gandharan symbol with a dot between two of the arms) / blank. 15mm, 1.5 grams. Rare. 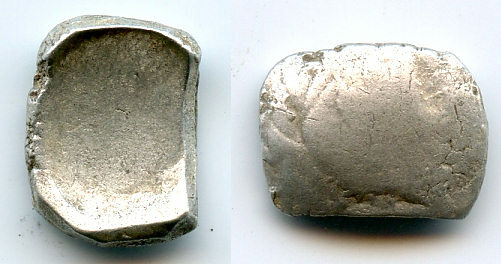 Rajgor 570var. Considerably scarcer than the preceding types. Punchmark (6-armed Gandharan symbol with a dot between two of the arms) / blank. 13mm, 1.2 grams. Rare. Rajgor 577. 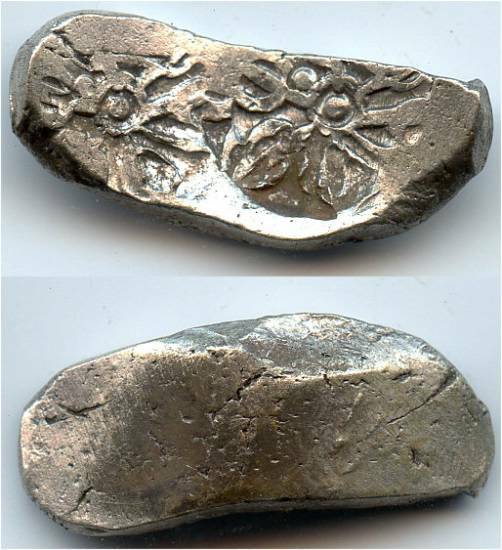 Debased silver, later type. Fairly scarce. Punchmark (6-armed Gandharan symbol with a dot between two of the arms) / blank. 15mm, 1.42 grams. Rare. Completely unpublished. I know of only one specimen of this type (the coin pictured). Punchmark (6-armed Gandharan symbol with a dot between two of the arms) / blank. 12mm, 1.2 grams. Rare. Rajgor 578. Extremely debased type, seems to be made out of copper. A very late type. Rare. uncertain Some coins are made in a very crude style, like the coin pictured. It is impossible to know which of the above types it is supposed to be. Punchmark (6-armed Gandharan symbol with a dot between two of the arms) / blank. 12mm, 0.7 grams. Rare. 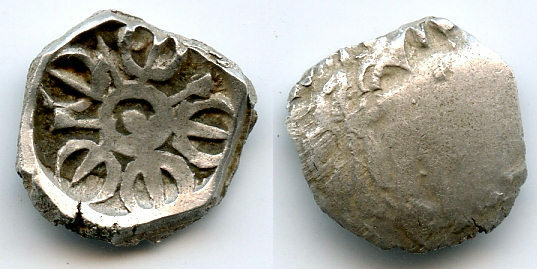 Rajgor 579var. The small half shana is much scarcer than the larger silver 1 shana. The symbol usually looks a bit awkward because it is so small and was (presumably) hard to engrave. Punchmark (6-armed Gandharan symbol with a dot between two of the arms) / blank. 8mm, 0.5 grams. Rajgor 577. 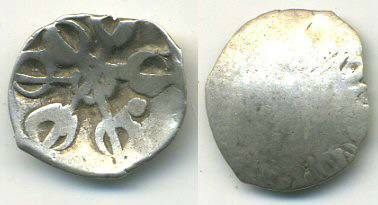 I am not sure if this type exists - this is the only type listed for 1/16th shatamana (1/2 shana) listed in Rajgor (citing Bhir Mound hoard). I have never encountered a 1/16th shatamana with a symbol without dot. It may exist, or it might be a simple misattribution or accidental omission of the dot. 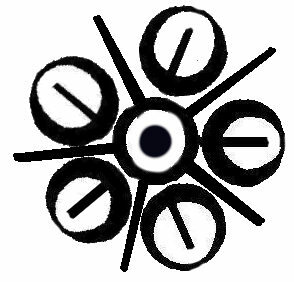 No photo (existence doubtful) Round scyphate flan, uniface, single symbol. Punchmark / blank. 7-9mm, 0.20 grams. Rajgor PMC 579a. 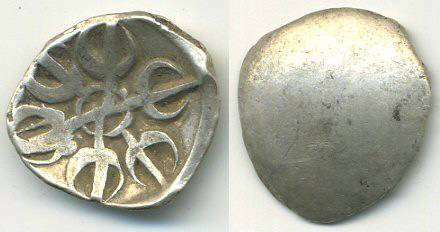 I have never seen a 1/4 shana of this type from Gandhara, but it is listed in Boppearachchi 1995 (numbers 47-49) and in Rajgor (who cites the Boppearachchi coins) #579a. I doubt this type actually exists - it is probably the next type, struck on a small flan. All coins of this type are very rare. Punchmark / blank. 9mm, 0.28 grams. Rajgor PMC -. Extremely rare, with only 2 confirmed specimens known. 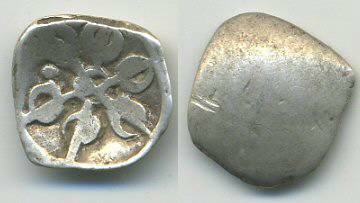 In a hoard of about 2000 Gandharan silver 1/8th and 1/16th shatamanas, a single coin of this type was found. It is not published elsewhere, but it is possible that the previous type is simply the misdescribed coin of this type. Round slightly scyphate flan, uniface, single symbol. Punchmark / blank. 8.5m, 0.28 grams. Rajgor PMC -. Very rare. A few dozen coins of this type appeared on the market in 2014. They seem to be from the later issues, a bit crude and struck in somewhat debased silver. The size is around 9mm, the weight of the specimens I got to examine range from 0.26 to 0.30 grams). 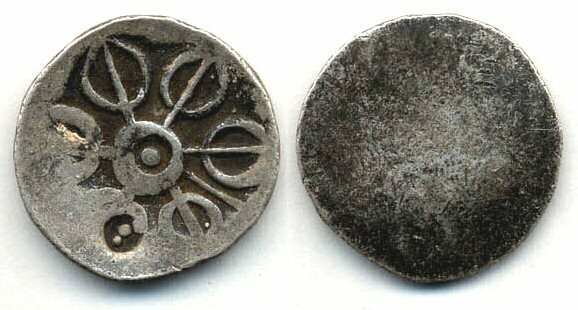 Blank flans of 1/4 and 1/8th shatamanas are sometimes found in hoard of Gandhara coins. These are quite rare. Interestingly, some of them have bankers' marks, showing that the coins probably circulated as normal coins. Blank 1/4 shatamana (2 shana) blank from a hoard of Gandharan coins. 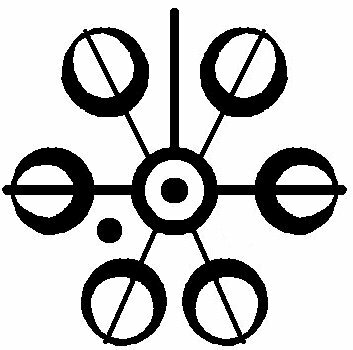 Blank, a single banker's mark / Blank. 13-12mm, 2.85 grams. Rajgor -. 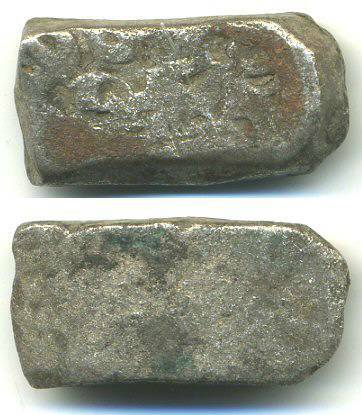 Blank 1/4 shatamana (2 shana) blank from a hoard of Gandharan coins. Blank / Blank. 14-11mm, 2.90 grams. Rajgor -. Blank 1/8 shatamana (shana) blank from a hoard of Gandharan coins. 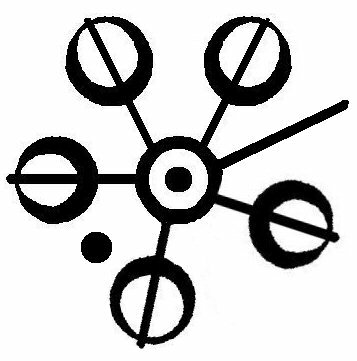 Blank, a single banker's marks (?) / Blank. 11-10mm, 1.38 grams. Rajgor -.